Samsung DeX promises to usher in a new era of mobile-powered desktop computing. Here’s a guide to understanding what DeX is, how it works, how it can replace your other computing devices and what benefits it can bring to you or your company. Samsung DeX is not hardware — it’s a platform that extends your smartphone into a desktop computing experience. It runs on all of Samsung’s flagship smartphones introduced since 2017, including the Galaxy S8/S8+, Note8, S9/S9+, Note9, S10e, S10 and S10+. DeX is also available on Samsung’s Galaxy Tab S4, where it can be used directly on the tablet’s screen with the keyboard case or on a connected monitor with an external keyboard and mouse. 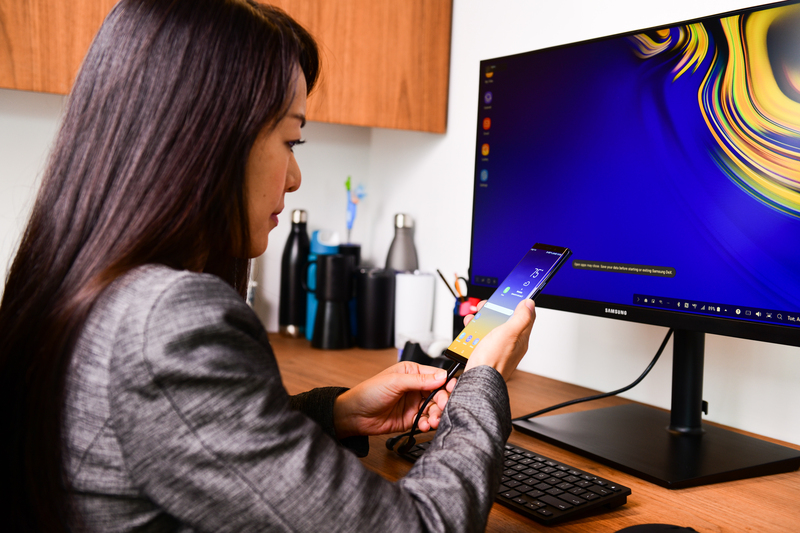 In the initial iteration of Samsung DeX launched in early 2017, a docking accessory called the DeX Station was required to connect your smartphone to your monitor, keyboard and mouse. In early 2018, the DeX Pad was launched, which allowed users to use their phone as a touchpad in DeX mode, while still serving as a dock with USB, HDMI and USB-C ports. With the launch of the Note9 in August 2019, Samsung introduced the DeX HDMI adapter, cable and multiport adapter, eliminating the need for the previous docking accessories. Once connected to a monitor via one of these adapters, the Samsung DeX platform boots up quickly on the monitor, presenting the user with a familiar desktop experience complete with resizable windows, drag-and-drop functionality and keyboard shortcuts. Read on for more tips on navigating the DeX interface — but first, here’s a review of the pros and cons of the three accessories. Which DeX Adapter Is Best? The three available Samsung DeX adapters offer different advantages depending on where and how you use the platform. Compact and pocketable, the DeX HDMI adapter allows you to easily connect your phone to a standard HDMI cable on your monitor. Since there are no additional ports to connect a USB keyboard and mouse, you’ll instead need to use Bluetooth peripherals. For longer DeX work sessions, rely on wireless charging to keep your battery topped up. The DeX cable is like the standard HDMI adapter but is 1.4 meters long, and plugs right into your monitor. It’s ideal if you plan to use DeX primarily in one location and can leave the cable connected to your monitor. It’s typically used in corporate hot-desking scenarios, where users drop by, connect their phone to the cable and get to work. With a full range of ports, the DeX multiport adapter offers the most flexibility in using DeX. In addition to the HDMI port to connect to your monitor’s HDMI cable, you have a USB 3.0 port to connect a keyboard or mouse, a Gigabit Ethernet port for wired internet, and a USB-C port to connect your phone’s charging cable. The multiport adapter is also compact and easily pocketable. 1. If you’re using the DeX cable, connect it to your monitor’s HDMI port. If you’re using the HDMI or multiport adapter, just connect the adapter to your monitor’s standard HDMI cable. 2. Connect your keyboard and mouse. If you’re using the DeX cable or HDMI adapter, you’ll be pairing a Bluetooth keyboard and mouse. On your phone, turn on Bluetooth and scan for your peripherals; then follow the manufacturer’s instructions (which often involve holding down a Bluetooth button to make the device visible to your phone). If you have the multiport adapter, you have the option of connecting via USB 3.0. 3. If you are using the multiport adapter, you can also connect your phone’s charging cable to the adapter’s USB-C port and your Ethernet cable to the internet jack. 4. Connect your smartphone to the adapter by way of your phone’s USB-C port. You should see the Samsung DeX logo appear on your monitor as it quickly boots up. Adjusting your display settings: When you first boot up DeX, you’ll be prompted to check that the desktop is correctly displaying on your monitor or TV. If the corners of the DeX desktop do not fit properly within the display, you’ll need to go into the settings menu of your monitor or TV to adjust the scaling. This is particularly common on TVs where the picture may be set to a certain aspect ratio. Select the “fit to screen” option and you should be all set. Screen mirroring vs. DeX mode: In your phone’s notifications menu, you’ll see several new options after connecting to your monitor, including the choice to move between screen mirroring and DeX mode. As its name indicates, screen mirroring will simply mirror what’s on your phone screen to the monitor. Screen mirroring is useful in some circumstances, but DeX gives you a much different, completely optimized desktop computing experience for productivity work on a larger screen. Tap the notification to go into DeX mode. Use your phone as a touchpad: Also in the notifications menu on your phone, you’ll see the option to use your phone as a touchpad. After selecting this, you’ll be able to use your finger or an S Pen to navigate within DeX. This is great if you don’t have a mouse handy and want to open an app, Powerpoint or video, especially if you’re using DeX in a presentation setting. When using DeX on the Galaxy Tab S4, you can also use your tablet as a graphics pad to sketch and draw. Launch and maximize your mobile apps: All of Samsung’s core applications are optimized for DeX, meaning you can resize and maximize the apps. You can also use right-click functionality and keyboard shortcuts. There are dozens of third-party apps that are fully optimized for DeX, including the Microsoft Office suite, Adobe Acrobat Reader, Photoshop Lightroom, Photoshop Sketch, Gmail, Chrome, BlueJeans, GoToMeeting and all the leading VDI clients, to name just a few. For those that aren’t optimized for DeX, read on for the next tip. Activate DeX Labs: DeX Labs offers access to “experimental” features that aren’t officially supported. Two current features include allowing DeX to force apps to resize and auto-open the last used app. To activate, click the DeX logo on the bottom right of your screen, open DeX Labs and toggle the features on. Now, when you open an app that is not DeX optimized, you’ll be given the opportunity to force resizing. This will allow you to view it in a larger window or even in fully maximized view. Samsung DeX is intuitive and an easy learning curve for most Galaxy smartphone users, but here are a few tips to help you become familiar with the interface. We’ll start from the bottom left and run through the various on-screen menus. Lock or Exit DeX: Tap the DeX logo at the bottom right corner if you want to lock DeX while you leave your desk for a moment. You can also exit DeX mode here or switch to screen mirroring. Apps Tray: Next to the DeX logo at the bottom left of the interface, the apps tray icon (the grid with nine dots) gives you access to all of the apps on your phone. They’ll be arranged just as you see them on your phone. You can browse between screens or use the search bar to find what you’re looking for. Recent, Home and Back: The other three icons in the bar at the bottom-right of your screen will be familiar. They are the same recent, home and back icons you’ll see at the bottom of your phone’s screen, and give you a quick way to hop between apps and get back to your desktop. You can also use the shortcuts to your currently opened apps that appear just to the right of this menu. Notifications Menu: You also have easy access to your phone’s notifications menu in DeX mode — it’s the left-most of the three menu bars on the right side of your screen. Just tap the three dots to expand the menu to see all your notifications. Quick Settings Menu: Next up is the Quick Settings menu (the one you normally access by swiping down from the top of your phone). Here you can see your battery life, alarms and Wi-Fi and cellular connectivity. Hit the delta symbol to expand the menu and adjust your settings. Not to be missed, the final menu at the far right gives you quick access to a virtual keyboard, volume settings, screen capture, a search bar and your calendar (just click the date). For complete access to all of your mobile phone’s settings, you can also open the regular Settings app in DeX mode. 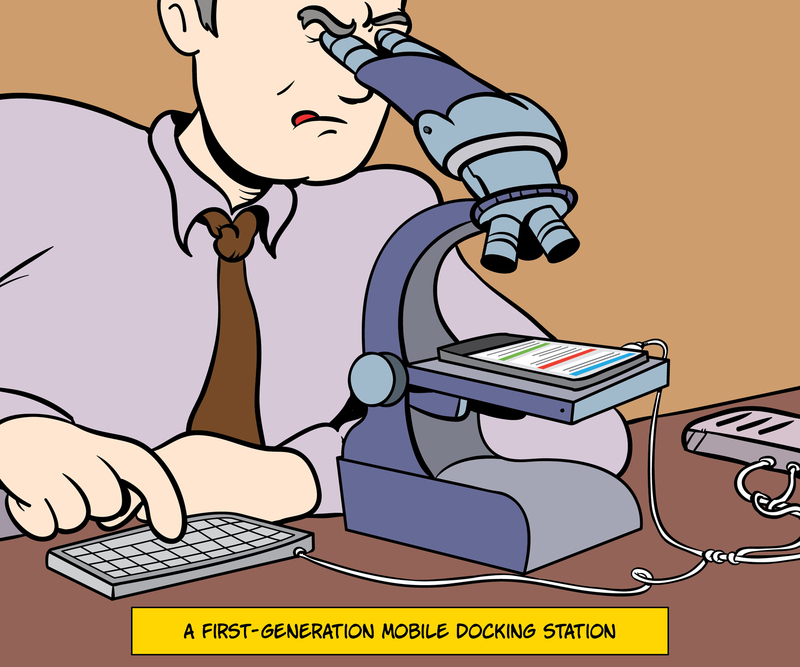 Today’s smartphones offer enough computing power to complete most work tasks, but the limitations of smaller screens can make it difficult to multitask or do heavier productivity work. Using Samsung DeX with a full-size monitor, keyboard and mouse makes it possible to ditch the laptop or desktop PC for good. For individuals, DeX is a great way to work more flexibly. Instead of booting up your laptop to catch up on work at home, just connect your phone to a monitor and get straight to work. You can run up to five apps at once and easily get most tasks done without hassle. For business owners and IT decision makers, DeX allows you to consolidate your IT investment and device management. By using a smartphone as their primary computing device, your team will have access to corporate email and apps — instantly accessible, wherever they are. Rather than having a dedicated PC for each employee, you can deploy flexible workstations using a DeX cable, Bluetooth keyboard and mouse, knowing that users can drop in and start working within seconds. Even businesses that are reliant on legacy Windows applications that don’t have mobile or web versions should consider DeX as an option. You can leverage a virtual desktop app like VMware or Citrix within DeX to access a full Windows desktop. What Benefits Can DeX Bring to My Company? Having one piece of tech that connects everything brings a wide range of benefits for both the employee and the business. For the employee, it means using a single device, knowing how to instantly access all the information they need without having to navigate multiple OS platforms or remember to share projects and data from one device to another. It also means the employee can personalize the device to their needs, making it much more efficient than using multiple devices. For the small or midsize business, there is the obvious benefit of reducing costs by decreasing the number of PCs and laptops you have to buy. But beyond those upfront savings, giving employees the flexibility to work means businesses can expect improved efficiency, communication and productivity. Using DeX also brings security benefits. Samsung smartphones are protected by advanced biometric security and Samsung Knox, a defense-grade security platform that’s designed from the chip up to protect devices from the minute they’re powered on — so you can be sure your information is safe. With Knox, you’re given powerful tools to manage company devices and enable your own security protocols, including containerization and application whitelisting and blocklisting. Mobile computing is already transforming productivity across many industries, and SMBs will want to get on board sooner rather than later. Samsung DeX provides a ready-made, out-of-the-box solution, with powerful security protections built in. Learn how SMB solutions can be tailored to boost productivity and enhance workflow at your business.